Derma Matrix Advanced Skin Complex - 183 g.
Derma Matrix ™ provides a high-tech formula designed to hydrate the skin from within. This formula contains BioActive NeoCell Collagen ™, which is created through a patented micronisation process and dissolves instantly in water or juice! Collagen in Derma Matrix ™ is standardized and bioactive for maximum absorption by the body. Derma Matrix contains super collagen, which is enzymatically processed in amino acid form with very low molecular weight only (2000 daltons) and is absorbed into 100% of the body. Derma Matrix is ​​clinically tested and helps smooth out wrinkles, maintains skin elasticity and hydration, removes cellulite and acne, and also strengthens hair and nails. Derma Matrix contains type I and III collagen 6000 mg, which is found in the body and is 100% natural. It contains a unique amino acid complex of 19 of the most important amino acids, such as lisine; Proline; Hydroxylisine and hydroxyproline, which stimulate the production of new collagen fibers in the body. Derma Matrix reduces wrinkle depth by 26%, increases skin hydration by 50%, reduces pores by 35% and increases skin elasticity by 19%. Hyaluronic Acid is particularly important for maintaining youthfulness of the skin. It has a powerful anti-aging effect. Maintains the elasticity of the skin and slows the aging process. Hyaluronic acid is naturally present in almost all tissues of the human body, as one of the most hydrophilic molecules, which is rightly called "natural moisturizer". Its unique ability is that it provides complete hydration and freshness to the skin. It keeps its density, makes it smooth, stretched and youthful. Collagen is a complex structural protein that builds the fibers of hair, skin, nails, tendons, muscles, bones, cartilage and joints. In other words, collagen is the major protein that accounts for over 75% of the connective tissue in the body. Unfortunately, after the age of 25, the body reduces collagen production by 1.5% per year, and when it reaches 40, collagen in it decreases by 25% and by the time you reach 60 years the body loses 50% of its collagen. Therefore, it must be taken extra! The skin begins to thin and the first wrinkles and signs of aging appear. Amla or Indian Grape Extract has been used for centuries in Ayurvedic medicine and is well known for its anti-aging properties. Amla extract contains high levels of vitamin C and has been favored over the years for being a powerful antioxidant. Vitamin C is an antioxidant that is very important for the absorption of collagen from the body. 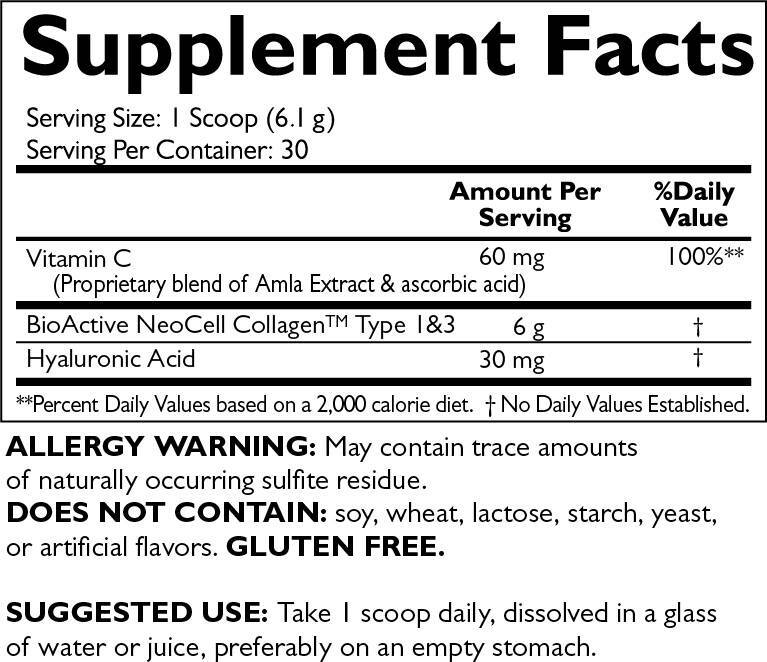 100% pure bioactive bovine type I and III colostrum - 6600 mg.
Hyaluronic Acid - 30 mg.
Amla extract - 60 mg. Method of consumption: Take one dose in the morning 30 minutes before meals. Dissolve 1 measuring spoon in a 200 ml water or orange juice. Stir well before drinking. Recommended intake of at least 3 months.